Happy Easter! Today marks the end of a huge production push for those of us in the chocolate business, and we hope that it’s been a successful holiday for all. Easter is a time for chocolatiers to showcase their creativity and artistry with products that are as beautiful and innovative as they are delicious. A fixture of Easter chocolate is, of course, the egg. As a shape it is beautifully symmetric, and lends itself to both the simplest and most complex of designs and decorations. And then there is the cast of animal characters – rabbits, chicks, lambs, pigs, frogs, and any other animal you can think of. Some chocolatiers create sophisticated characters, while others embrace their whimsical side with creatures that are almost too cute to eat – note, we said “almost”! So we wanted to share just a few examples of some of the products we came across in our travels on the interweb – some dazzled our eyes, others tickled our fancy, and some did a bit of both. This is by no means an exhaustive list, but we didn’t want to leave you reading until next Easter! Giorgio Demarini is a chocolatier at Roselen Chocolatier in Lima, Peru. 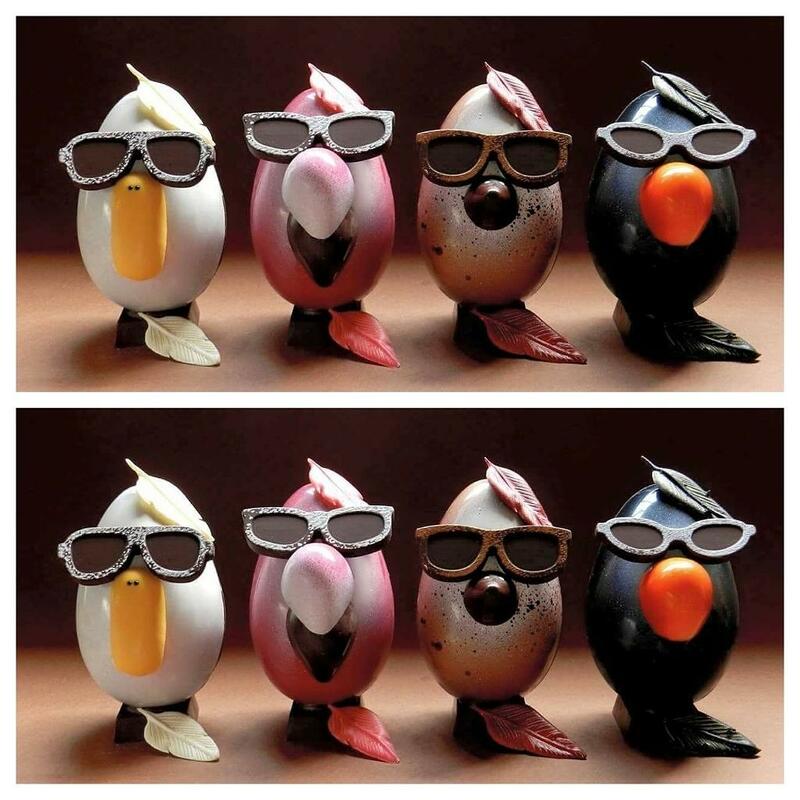 We love Giorgio’s whimsical take on Easter eggs with this “cool” group of iconic birds (from left to right: goose, flamingo, hen and toucan). Look at the artistry and detail that has gone into each one, from molding the chocolate, to adding the details and the colors. We are also so proud to say that he is an Ecole Chocolat graduate! Kate Weiser Chocolate is located in Dallas, Texas. A quick look through the photo gallery on Kate’s website or her Instagram account, and her talent as a chocolate artist comes through loud and clear. Each of her products are stunningly beautiful and perfectly presented. This is just one example of a showcase egg that she created. But true to her varied talent, looking through her Instagram account, you will see that she also created adorable bunnies, and even a chocolate solar system this Easter season! Toronto’s Soma Chocolatemaker is a perfect example of “bean to bonbon” – they not only make their own chocolate, producing a wide variety of award-winning bars, but they also create bonbons and confections from their chocolate. For Easter, they created beautiful, hand-made eggs on a nest of hazelnut chocolate made by an old Italian pasta press. They wrote about the process of developing this beautiful creation on their blog. Inside each egg is a fig stuffed with roasted almonds and butter caramel! Amanda Snouffer of Recchiuti Confections in San Francisco created this stunning showpiece for Valrhona’s special Easter contest. Look at all the intricate details…we love that she created a sculpture of bunnies sculpting chocolate – it’s almost a poetic nod to Michelangelo, who often said that he could see the sculpture within a block of stone, and that it was his job to free it. And last, but certainly not least, is this adorable creation from Glenn Knowles of Gem Chocolates in Vancouver, B.C. This little chick peeking out of the egg shell embraces the trend of showcasing both the outside and the inside of the egg. The photo highlights the detailed work involved in creating each one. We are so proud that Glenn is an Ecole Chocolat graduate! We hope that you enjoyed looking at these stunning examples of Easter chocolate! Happy Easter from all of us at Ecole Chocolat – we hope you are spending the day with your favorite people, and of course, your favorite chocolate! Next Post Butter Part Three: Is there any substitute?